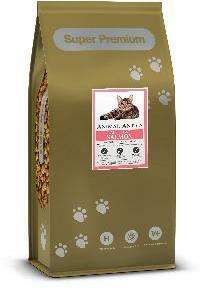 A highly palatable fresh salmon cat food providing cats with a balanced and complete diet. Ingredients Fresh salmon (min 26%), poultry meal, maize, white rice, refined poultry fat, beet pulp, salmon oil, brewers yeast, dried egg, fishmeal, sodium chloride, minerals and vitamins. Does super premium pet food have to come at a super premium price. When you buy big brand, big name petfoods, you pay a big brand price! Fancy bags, Free offers, television adverts, event sponsorship, area reps, their cars, their travelling expenses, Wagons and warehousing. WHY CHOOSE ANIMAL ANTICS? We are different. Just the good premium food in a simple bag with a simple label. Our advertising is purely through the internet website and through customers recommendations.